Tears are nobler than blood. But, is certainly not thicker than tears. A stone, a stick, a needle, a blade, a knife or a bullet. They once used to say that all are equal. Brought us all under one umbrella. The very blood circulates through all of us. But how can it stand a testimony of our humanity? But is there a nobleman’s blood and a common man’s blood? Tears are the archetype of the six-foot primal man. There are arcane lacrimal pools of tears in man. There are perennial sprouts of riverine mouths in him. Nor need cross his sword. For the tears to whelm you on their own. With tears streaming down… then you are a man. Man becomes an overcast sky. Man becomes a farm of rich water resources. We mine out from our own selves. Nor, like blood, tears flow to every nook of capillary in the body. Or, has this much of tears in him? A physical act is enough for blood to spill. The chemical reaction should take place. Paled out as positive and negative. But tears remained ever pure and clear… like rain water. Tears … are monuments of war’s devastation. Tears continue to swell in memories. But it is the tears that establish its existence. 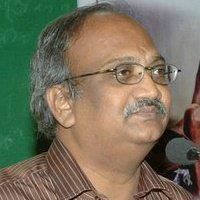 Sri Kopparthy is presently working as Principal, Govt. Degree College Eluru, WG Dt. AP. He has to his credit 3 Collections of Poetry and several awards. he can be reached at :kopparthyvrm@gmail.com. జీవితంలోంచి ముంచితీసిన కవిత్వ చరణం చాలు, కన్నీళ్ళకి.